Terratrike out for a ride. 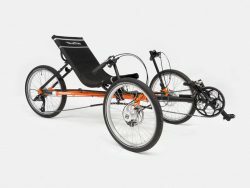 WizWheelz has been making TerraTrike recumbent tadpole trikes for over 17 years. They are simple, rugged trikes and relatively inexpensive. Currently they have six models: the Rover, the Rambler, the Tour 2, the Sportster, the Tandem and the Traveler. 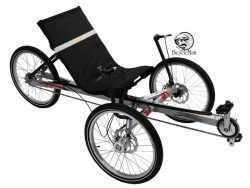 The Rover is a great tadpole trike for casual rides or for people overcoming mobility issues. The seat height and high handlebars make this a very easy trike to get in and out of. The shifting has been simplified so it’s out of the way of having a good time. The Rambler is a lighter, fancier version of the Rover. It shares the seat height and high handlebar but drops around eight pounds. It’s available with a wider spread of gears for those with hills. The Rambler is a good general purpose trike for people who need a higher seat. The Traveler is re-design of the Rambler frame to allow for folding. This is one of the VERY few trikes that can be folded small enough to be taken on an airplane. Terratrike offers a rolling luggage bag the trike fits into for travel. I think this will become Terratrikes most popular model. The Terratrike Tour 2 is the most economical trike I’d recommend for distance road riding. They adjust to fit the rider by moving the seat. This seat is a full mesh seat which also can be adjusted to different recline angles with telescoping struts & grenade pins as found on many recumbent bikes. The adjustable seat means you don’t have to mess with chain length when adjusting between riders, an advantage if you plan to share the trike. Another feature of the TerraTrikes is their relatively low bottom brackets. Your feet aren’t higher than your seat. TerraTrike Tour 2 frames come in three sizes to fit a wide range of rider sizes, from about 5’ to 6’5”. The Tour 2 has USS handlebars which can be adjusted to a comfortable position for your arm length. To fold them for travel you can remove the seats and that is about it. The Sportster is the highest performance Terratrike. It has an aluminum frame to save weight, a 26″ rear wheel for better top speed and a longer wheelbase for confident handling. This is a very adjustable trike-both the seat AND the boom can be moved to fit you perfectly. The Tandem is well….a tandem! There are not that many tadpole trike tandems on the market. The Tandem looks like a stretch limo version of the Tour 2 which is not a bad thing. It’s stable, comfortable and can be separated into two pieces for transport. Terratrike has also come out with a kit to transform the Rover into a simple tandem. The kit bolts on the back half of a Rover to stretch it out and adds another seat and crankset. In our experience, WizWheelz trikes have been more reliable than average and they have honored the warranty without a hassle.